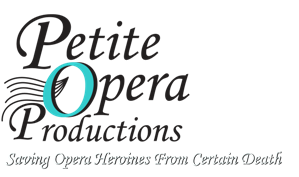 Petite Opera Productions serves up this original comic opera spoof suitable for everyone from complete opera novice to opera aficionado. The show serves as a wonderful introduction to opera genre and its composers, while appealing to American audiences of today. 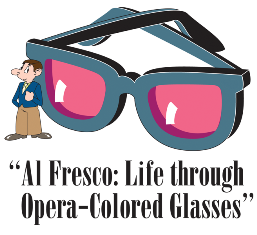 Al Fresco, a first generation Italian-American raised by an opera-loving family, is unlucky in love. As he recounts his life searching for the perfect girl, he finds himself living scenes from operas with modern-day versions of famous opera characters. This comic opera parody sets original English translations to famous music of Sullivan, Lehar, Rossini, Mozart, Bizet, Puccini, and Offenbach, to create an entertaining cross between grand opera and improvisation. And no opera heroines died to produce this show. Saturdays, Oct 31, Nov 7, and Nov 14, 2009. At 3PM: (Matinee) Sunday, Nov 8. 2009. Mary Wilson House Beyer Auditorium, St. Mary’s Episcopal Church, 306 S. Prospect Avenue, at Crescent Avenue, in Park Ridge, IL. Enter on Crescent Avenue. Venue doors and box office open 1 hour prior to show time. Auditorium doors open for seating 30 minutes prior to show time. Venue is handicapped accessible. Be certain to notify the Box Office of special needs for handicapped patrons at time of reservation. Seating: All seats are General Admission. Box Office Hours and Admission: Open 1 hour prior to show time. Auditorium doors open 30 minutes prior to show time. Adult tickets: Tickets are $25 when purchased at the Box Office on show dates. Tickets can be reserved by phone, or purchased online using a credit card. Student tickets: Tickets are $12 for school-age students (age 18 and under) who show a school ID. Price applies to tickets purchased in advance, or at the Box Office on show dates. To purchase tickets online using a credit card: Click the Purchase Tickets link at the top of the page. Credit card orders are accepted up until 3 hours prior to show time. Surcharges apply. Tickets will not be mailed, but will be held at the Box Office for pickup on the date of the show under your name. To purchase tickets online using a credit card: Click the Purchase Tickets link at the top of the page. Surcharges apply. Tickets will not be mailed, but will be held at the Box Office for pickup under your name on the date of the show. Adult tickets, purchased or reserved up to 3 hours prior to show time, receive a discount of $3 per ticket per order. Discount applies to tickets reserved by phone (847-553-4442) or purchased online via credit card. Discount will be automatically applied to online ticket orders and advance phone orders. Patron need not cite a promotion code to receive the discount. All orders received within the final 3 hours prior to show time will be charged full price. One discount per ticket per order applies. May not be combined with other discounts. Groups of 20 or more Adults can purchase tickets in advance (up to 3 hours prior to show time) for $20 each. Must cite discount code Group2020 at time of reservation or online purchase. Group of 20 tickets must be placed on one order, and paid in one lump sum. May not be combined with other discounts. For the October 30, October 31, November 6 and November 7 performances, every full-paying adult ticket at $25 also gets one student (school-age, age 18 or under, with school ID) in free. Patrons must cite discount code KidsPlus at time of reservation or online purchase. Same price applies whether order is placed in advance, or at the Box Office on show dates. Additional students attending with the full-paying adult are $12 each. When placing online orders, select Adult Quantity of “1” and Student Quantity of “1”. One discount per ticket per order applies. May not be combined with other discounts.